Well, kinda. The phrase actually translates literally as "A Hundred Thousand Welcomes." 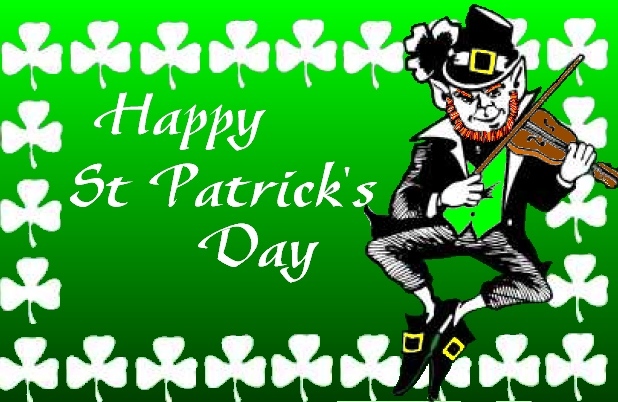 Mark this date in your diary - 17th March - it's St Patrick's Day. And if you don't do something to celebrate it in your local then you are missing a trick. And possibly lucrative extra income... But who was Saint Patrick? Little is known about him, but he was taken as a slave from his native Wales in Roman Britain, by Irish raiders at the age of 16. He was taken to Ireland where he lived for a further six years in captivity before escaping to a port returning to his family aboard a ship. In later life he entered the church, returned to Ireland where he was active as a Christian missionary, and became a bishop. Legend has it that he both drove snakes from Ireland, and used the shamrock to symbolise the holy trinity. St Patricks Day is celebrated in Ireland on the anniversary of his death on 17th March 461 AD (though the precise year is much disputed). Pour me a Guinness and grab me a leprechaun (and all those other daft racist stereotypes)- its that time of year again when we celebrate the culture and traditions of our brethren from the Emerald Isle. Whether it be Father Ted, or Daniel O'Donnell or even gap toothed smile of Shane McGowan, we love em all and this month celebrate the Irish. Whether you believe the saintly Patrick drove snakes out of Ireland or not (and we have our doubts), God bless and Happy St Patricks Day. Themes for an Irish evening include leprechauns, shamrocks, Irish flags, and the colour green in abundance. Your staff can perhaps join in the celebrations by sporting green outfits, or even dressing as the little folk!!! Naturally any Irish themed event will have plenty of Guinness available. But you might also want to provide your customers with traditional Irish foods such as Irish Stew, and soda bread. Your customers will probably be happy to pay a small fee for food and refreshments supplied, or alternatively you could include the costs in the price of entry to a pub quiz.